New year 2017 is beginning! It’s time again to take account of where we stand in our life’s dreams and goals. What can we check off the list? And, what is still in progress? And, maybe there’s something new to add. But first, let me count my blessings. I’m filled with gratitude, thankful for you! What a JOY it is to have friends like you to walk through this weaving journey with me. Glimåkra Ideal loom: Striped warp for the sample kit is all set! Winding quills is next. Then, weaving! If all goes well, a few pre-warped plattväv towel kits will show up in my Etsy shop. 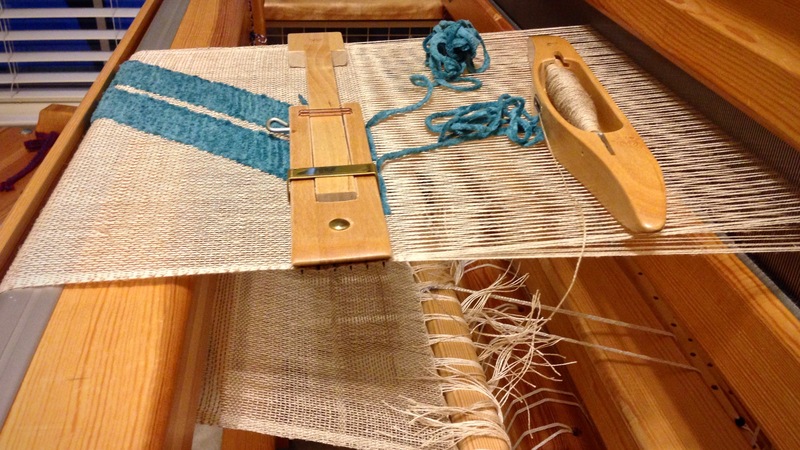 Glimåkra Standard loom: Weaving a transparency. 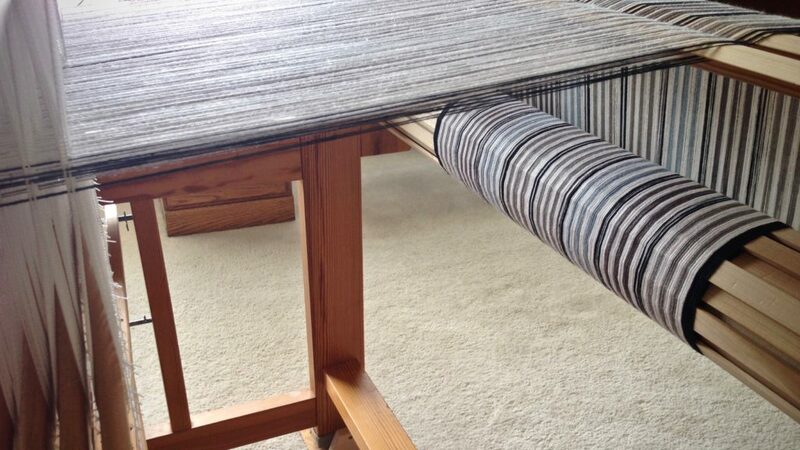 16/2 linen warp and background weft. The weft pattern inlay is cotton chenille. 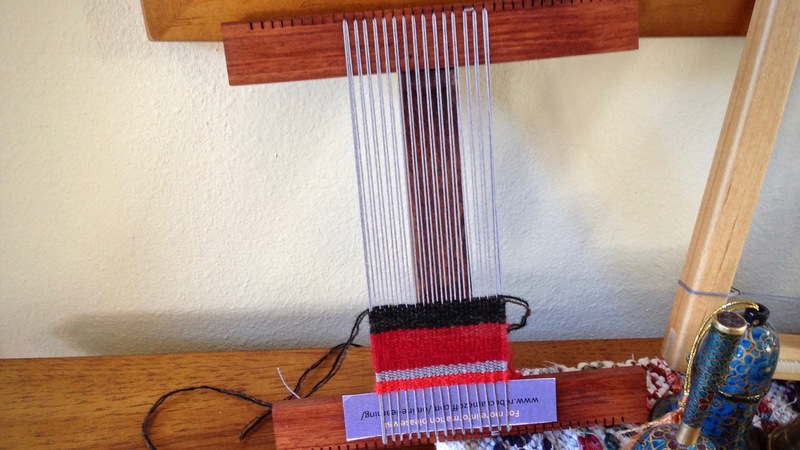 Hokett loom has the start of a simple stripes tapestry practice piece. 12/6 cotton warp, 6/1 Fåro wool weft. Thank you for joining me through 2016! May you have joy in the journey. I love the “Year in Review” and see so many favorites. Your work is simply beautiful and inspiring. You are brimming with talent! Hi Beth, There are several projects here that I want to do again! Especially the monksbelt. A lovely and inspiring post! I enjoyed the video of your weaving year. Hi Jennifer, Everything is better in the company of friends. Thanks for joining in! Truly Blessed, thanks for all you share. Hi Angela, Thank YOU for sticking with me. Hi Loyanne, I’m sure your scarf is beautiful! The monksbelt does use 16/2 cotton for tabby, and Faro wool for pattern weft. I’m not sure of your question… I have a feeling that spellcheck gremlins took over. Could you try asking again? Boy did the gremlins take over. I wondered how you wet finish a piece out of cotton and wool? Ok, now that question makes sense. 🙂 That’s a great question! I did not wet finish my piece because I am going to use it for a hanging, so I wanted it to soften up or get distorted through washing. I did steam press it, though, which helped to tighten everything up and straighten it out. I think if I were going to wet finish this cotton and wool combination I would gently hand wash in cool water with mild soap, like Eucalan, with as little agitation as possible. And then hang or lay flat to dry. If I had a sample piece, I would try washing that first, before submerging the main article. A year of accomplishing lots! You do black and white especially well. I enjoy your posts. Hi Fran, The black and white was a new experience for me. It was a surprise to me to find out how much I enjoyed working with it! Thanks for stopping by! I just joined in on your posts! It’s part of my goals for 2017 to surround myself with others who love weaving, and to be inspired and motivated to continue learning from them. Thanks for having this blog! Hi Cindy, A big welcome to you! I do love weaving, and you will find many who comment here are the same way. I love it that we can all learn from each other. I enjoyed seeing your transparency, because I have used the same 16/2 linen to weave pictorial transparencies for the last 10 years or so. Is your sett 12 epi? How many selvedge warps are doubled on each side? I have never tried using chenille for the inlay, but this gives me a new idea to try! Happy New Year, and God bless you and your family! Hi Lynette, I’m excited to hear that you weave pictorial transparencies! This is my first attempt, and I’m enjoying it very much. I would love to see some of your work. Can you send me pictures? I am using a metric 50/10 reed, which is just a little more dense than 12 epi, but pretty close. I doubled 4 selvedge warps on each side, as instructed in The Big Book of Weaving. Hi Karen, Happy New Year! Thank you so much for all the work you do for us, your posts are always beautiful and informative. I have been sick for a bit but I can’t wait to get back to my loom soon. Hi Liberty, It’s no fun to be under the weather. I hope you’re all better very soon! I always appreciate your sweet encouragement. The year in review is so Inspiring Karen! Sometimes we don’t look back to view where we’ve come from. We just keep plowing forward. The past gives us a much needed perspective on where we’re going. Your video reminded me of that simple face. And the music was perfect for that reflection. Thank you Karen. Keep up the ‘good’ work. I completely agree! Perspective can make a world of difference. I appreciate your thoughtful words so much! Happy weaving new year to you! I love your web page. I look forward to each one. I have learned a lot from you even tho I have been weaving for about 12 years. Hi Pat, This is such a sweet thing for you to say! It’s my goal to be a help to others, so I’m thrilled to hear you’ve learned some things here.